The most important step in preserving old media, be it still photographs or old film reels, is to properly and safely digitize the originals. Every media format has a life expectancy and even sitting well protected in a perfect environment will not preserve them forever. Photographs yellow and fade while old films become brittle and gradually decompose. Handling old materials accelerates all of these natural tendencies due to dirt and oils on our hands along with the simple mechanics of handling. And many old media is simply not easy to view at all. How many of us have a properly functioning 8mm or 16mm projector handy? Even a super 8mm projector in great condition is becoming an unusual device. Ironically, newer media such as video tape is likely to degrade at a faster rate than old film! People with a library of family videos on VCR cassettes are almost certainly losing image quality not to mention the obsolescence of the venerable VCR itself. One of the best options is to digitize everything you can before they start to deteriorate any more. Essentially to preserve the best quality of the original materials into a contemporary media format and then, onto a contemporary media storage device. iMemories is a service that provides a complete package for this process as well as the ability to edit and organize your media, should you wish to do so, and put the results onto DVDs or a hard disk drive. 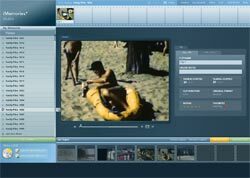 Even if you are familiar with and comfortable using image and video editing software on your own computer, it is very unlikely that you would have access to high quality digitization methods. Open a free account with iMemories. Send them your original films, photographs, or tapes. Pay for what you want digitized based upon a quote they will provide following receipt of your materials. Await the results of the digitization. Edit your materials into a finished state and order DVDs of the results if desired. The originals will be returned via FedEx. Purchase a hard drive and get the high-res versions sent to you if desired. Transform old photos and videos to digital with iMemories.